A foreign maggot species that feeds on the living flesh of animals and humans has recently been discovered for the first time on the Florida mainland. 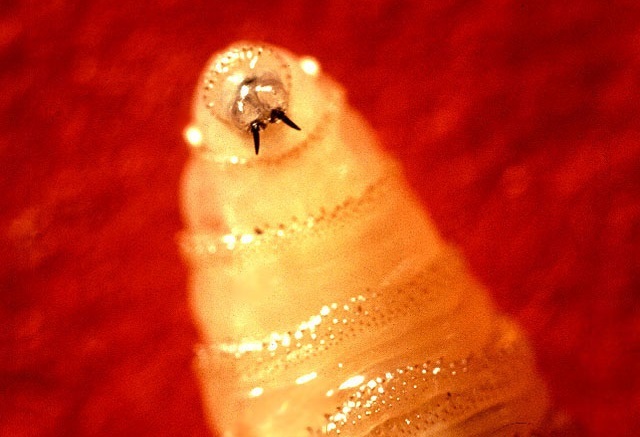 The invasive species, called New World screwworms, are fly larvae (maggots) that can infest livestock and other warm-blooded animals, including people. Once confined to only the Florida Keys, the United States Department of Agriculture confirmed the presence of the screwworm in a stray dog near Homestead, Florida. The dog was isolated and his infested wounds were treated. Officials say that the he is now in good health. Federal and state officials have since started active surveillance in the area. Screwworms were first confirmed on October 3, 2016 in Key deer from National Key Deer Refuge on Big Pine Key, Florida. This initial presence of screwworm was the first local detection in the United States in more than 30 years and Florida’s Commissioner of Agriculture, Adam Putnam declared an agricultural state of emergency in Monroe County, Florida. Since October, thirteen Keys had known infestations mostly in the key deer population, with five confirmed infestations in domestic animals. Animal health and wildlife officials at the state and federal levels say that they have been working aggressively to eradicate this pest. Screwworms most often enter an animal through an open wound or, in the case of newborns, the navel. They feed on the animal’s living flesh and, if not treated, infestations can be fatal. The New World screwworm (Cochliomyia hominivorax) has not been widely present in the United States since the 1960s, but is still found in most of South America and in five Caribbean countries. Florida residents who have warm-blooded animals (pets, livestock, etc.) should watch their animals carefully. Florida residents should report any potential cases to 1-800-HELP-FLA (1-800-435-7352) or non-Florida residents should call (850) 410-3800. Visitors to the area should ensure any pets that are with them are also checked, in order to prevent the spread of this infestation. While human cases of New World screwworm are rare, they have occurred, and people are urged to keep wounds clean and closely monitor open cuts and wounds for the presence of maggots. Anyone who suspects the presence of screwworms should contact a physician immediately. So far, no human cases have been reported in Florida. The adult screwworm fly is the size of a common housefly, or slightly larger, but different in color and appearance. The screwworm fly has orange eyes and a metallic dark blue to blue-green or gray body. It also has three dark stripes running down its back, with the middle stripe shorter than the outer two. A female screwworm fly typically mates once in her lifetime and lays her eggs on or near an open wound or the mucous membranes of an animal’s nose, mouth or ears. In her lifespan, the screwworm fly can produce thousands of offspring. The eggs hatch into larvae within a day and then feed on the animal’s tissue for five to seven days before maturing. The mature larvae then tunnel into the ground and emerge as adults, ready to mate and continue the cycle.